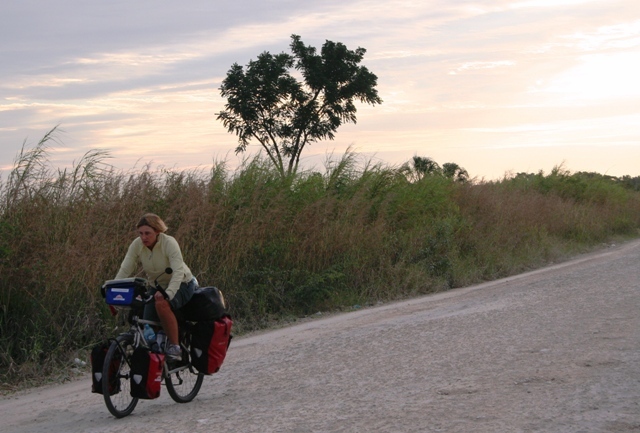 We biked across the border into Belize and the world changed. Mexico’s busy expressways gave way to a narrow two-lane highway. American-style super mercados were replaced by tiny corner shops where locals congregate to gossip, throw back an ice-cold coke or just hang out and watch the world go by. Villagers smiled and waved as we pedaled past, toddlers squealed with delight and shouted out an endless mantra of ‘bye-bye, bye-bye, bye-bye as we bounced along the road. Rural Belize is so backwards it even has roadside water pumps, something we hadn’t seen since Africa. The only difference is that in Africa there were always long lines of women and children waiting patiently for their turn to fetch water. And without a doubt a gaggle of girls vying for the honor of pumping water for the exotic foreign visitors on bicycles. In Belize we had to pump our own water. Belize is a popular spot for beach holidays and diving vacations, but it wasn’t the touristy side of the country that interested us. We’d hung out at Caye Caulker, done the snorkeling stuff and checked out Belize city during a year-long Latin America backpacking trip way back in 2001. We were after a taste of ‘authentic’ rural Belize. Our map showed a short cut off the main highway leading to the city of Orange Walk. Perfect. We headed down a dusty rutted track, and when we spotted a group of men loading sugar cane onto an already seriously overloaded truck, we stopped to check directions. “Yes, that is the problem. Sometimes there are bad people out here in the cane fields, if they see you alone…” And he hesitated before making the international gesture of someone getting their throat slit. That did it for me. I pointed my bike back towards the main highway and started cranking the pedals. Call me a wimp if you will. Eric did, when he finally caught up with me. Maybe not, but I wasn’ too keen on taking any chances. The memory of being robbed by 5 machete-toting campesinos in neighboring Guatemala was still too fresh—even after 8 intervening years. So my fears (the word ‘unwarranted’ would be inserted here if Eric were writing the blog) put a damper on our discovering the ‘real’ Belize. We didn’t visit Belize City because an old lady at the crossroads told us the place was awash with pistol-toting thieves. We didn’t even dare venture into the village of La Democracia because a Honduran émigré we met up with said he wouldn’t go near the place unless he was armed with at least a machete. So I let fear get the best of me in Belize. It happens. How do you fight your bike touring fears? What would you have done in our situation? Discover all the hidden fringe benefits of bike touring—even how to become an overnight superstar. Plus a few key ways that a bike tour can translate into tangible job skills.